Home › Facts › How left are you? We all know which hand we hold a pen with, but how far does this bias extend throughout your body? Are you left-eared? Left eyed? Here are some simple tests you can apply to yourself. Imagine the centre of your back is itching. Which hand do you scratch it with? If you have always considered yourself to be right or left-handed you will probably now have discovered that your body is less than total in its devotion to its favoured side. 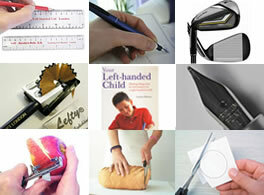 If you are right-handed the chances are that you were not able to be ‘right’ 10 times. 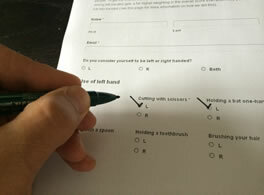 We have produced a survey for Left-Handers Day where you can record which hand you use for various activities and get an overall rating for how left-handed you are – click here to see the test form. Being left-handed Is it me? the 1 to 10 left or right test How left handed are you, said, “If you have always considered yourself to be right or left-handed you will probably now have discovered that your body is less than total in its devotion to its favoured side.” I got 10 out of 10 for my left side!! Okay, I think your How left-handed are you quiz needs a space for notes. I came out as mainly Lh’d. MAINLY! I AM LEFTHANDED. My mother was left-handed. I have a left-handed daughter and my other two children have left-handed tendencies. 1. When I was a child, I broke my left arm twice and had to learn to write with my right hand. I no longer do. 2. I have a lazy eye, my left, so I have no choice but to use my right to see with (no 3D films for me). 3. I was taught to knit and crochet by my grandmother, who was right handed. And to play the piano and there’s no way you can do that left handed, not easily anyway. It’s a right handed world. Lots of us are taught skills by right handed people or through no choice, have been forced to use right handed equipment for most of our lives. I don’t know what I’d do with it if someone gave me a left-handed tin opener, I’ve been doing it right handed for so long, it’s become second nature. It doesn’t make me any less left-handed. If I was forced to put a spoon in my right hand to eat, I’d quickly lose weight (note to self, must try that). 4. You have missed a vital left-handers skill, which is reading backwards. I don’t just mean Jabberwocky style, although I can read and write upside down, inside out and back to front. No, I mean, when you pick up a magazine, where do you start? I invariably start from the back, which makes more sense when you’re a left-hander, flicking the pages with your left hand, and I’m surprised more books for the left-handed aren’t written from the back forwards. I’m sure I could come up with more but it’s 5 minutes to midnight and I’m a bit tired. On the whole though, well done, love the mag. 1 Pings/Trackbacks for "How left are you?"